Miyeokguk is a Korean soup made from seaweed or lavers where miyeok literally means sea vegetable and guk meaning soup. 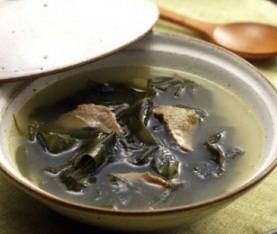 It is known as a highly nutritious soup and widely consumed at homes as well as restaurants in Korea. It is typically consumed by women after giving birth as miyeok contains a high content of calcium and iodine, nutrients that are important for nursing new mothers. So Korean women typically consume this soup while pregnant. It is also traditionally eaten on birthdays for this reason, a reminder of the first food that the mother has eaten and passed on to her newborn, thus bringing good fortune for the rest of the year. There are various methods of making this soup dish, but it is usually made by soaking dried seaweed sheets in water until it softens and adding the seaweed in soup stock. The stock may be made from beef and/or seafood such as mussels, clams and/or dried fish. The soup is seasoned with soy sauce or salt as well as minced garlic and sesame oil for additional flavoring. Soak seaweed in cold water for approximately 5 minutes until it becomes soft. Drain and rinse seaweed in cold running water couple of more times. Then cut into 2 inch pieces and set aside. Heat a cooking pot over medium heat and add sesame oil, soy sauce, minced beef, garlic, and salt. Stir and cook for 1 minute. Add seaweed and stir occasionally for another minute. Pour water, cover pot and bring to a boil. Reduce heat and simmer for 20 minutes. Season to taste with ground black pepper and/or salt. Serve in individual bowl and with steamed rice.